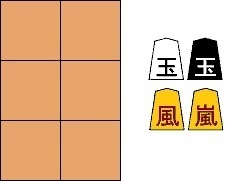 Gufuu shogi is a modern variant of shogi (Japanese chess). It is not Japanese, having been invented in 1998-2001 by Georg Dunkel of Finland and it incorporates elements of Unashogi by starting with an empty board. It also incorporates the concept of shared pieces, pieces controlled by both players on their respective turns. Two players, Black and White (or 先手 sente and 後手 gote), play on a board ruled into a grid of 3 ranks (rows) by 2 files (columns). The squares are undifferentiated by markings or color. Each player has a king, distinguished by color (black and white). There are two additional pieces which are of neutral color: the Kaze (風 "wind") and Arashi (嵐 "storm"). The board, 3x2, starts out empty. The kings are dropped first, followed by the Kaze by Black, and the Arashi by White. The Kaze and Arashi are shared pieces, and as such, belong to Black on Black's turn and White on White's turn. The only exception is when either general is delivering check, in which case they (at that turn) belong to the player delivering check, and cannot be moved by the opponent in check. It is also not permissible to capture the checking piece with the king. The king may move next to each other, but may not directly face each other.